Check Out These 5 Jigsaw Jones Books . . . Coming August 8th! Look what came in the mail yesterday . 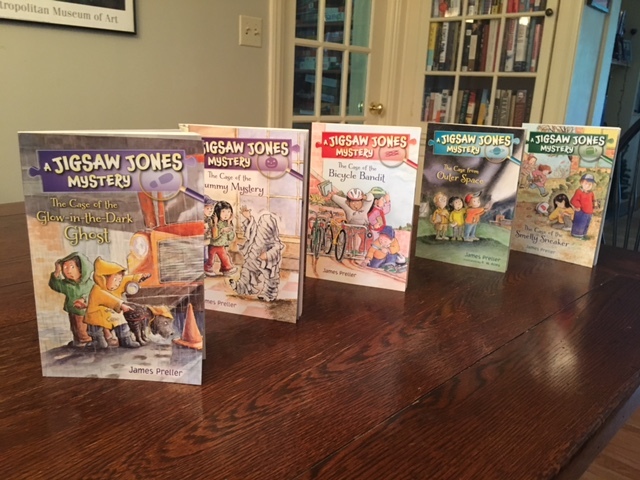 . .
I’m happy to announce that on August 8th these five Jigsaw Jones books will be available in stores for the first time in years. Published by Feiwel & Friends at Macmillan. Leading off, The Case from Outer Space: A brand-new, never-before-published story for a new generation of young readers. Librarians please note that it’s also available in hardcover, a first for Jigsaw. Lastly, older readers (grades 4-7) might be excited about my upcoming hardcover book due out in October, a zombie-goes-to-middle-school story titled Better Off Undead (Macmillan, 275 pages, October 2017). Talk about misfits. Adrian Lazarus is the ultimate outsider. But slowly Adrian makes a small but fascinating group of friends: the bee-obsessed Zander Donnelly; the seventh-grade sleuth, Talal Mirwani; and the mysterious Gia Demeter, who just might be able to see into the future. After they discover that someone has been spying on Adrian with a birdlike drone, the mystery deepens. The clues led Adrian to two powerful corporate mogals . . . and a thrilling conclusion.